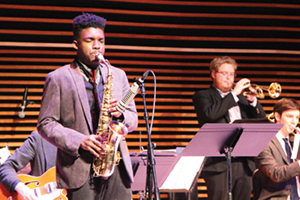 You are invited to attend the annual UT Jazz Festival for Middle and High School bands. The festival will take place on Saturday, March 25, 2017 at the Natalie L. Haslam Music Center on the UT campus. Participating bands will have the opportunity to perform for a panel of experienced jazz artist/educators in a non-competitive environment and receive feedback on their performance in a clinic setting. The festival also presents master class opportunities for students, including sectional workshops for saxes, brass, and rhythm led by members of the University of Tennessee Jazz Faculty, and a jazz master class with John Clayton, world renowned bassist and bandleader of the Clayton-Hamilton Jazz Orchestra. 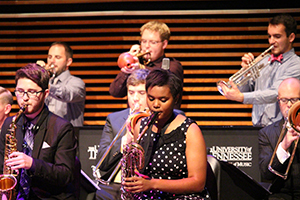 The concluding concert will feature John Clayton leading the University of Tennessee Jazz Big Band and performing with the Jazz Faculty Ensemble. There is a registration fee of $100 for large ensembles and $40 for small ensembles. For more info, click HERE. For questions not answered by the website, please e-mail mboling@utk.edu.